Isn't it BEAUTIFUL?! We ordered this couch back in September but they had to order it in so it only just arrived on Wednesday. It's the perfect couch. Charcoal grey, clean lines, modern but still super comfortable. 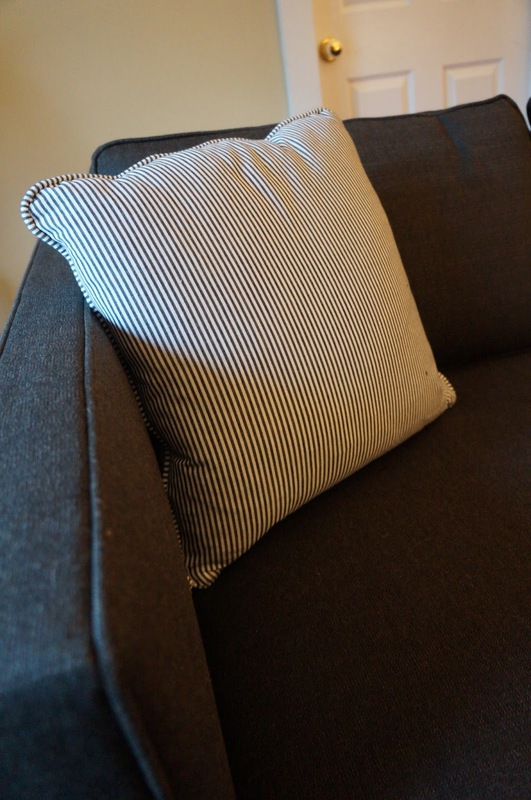 We chose a subtle black and white ticking stripe for the two pillows, which I love. I plan to add a few more larger pillows. Something I can karate-chop, haha. Also, one of these gorgeous wool throws is on my Christmas list, which I'd fold over the back of the couch when not in use. I can't wait to share the whole room once we finish up a few little projects! We've come a long way from this post!